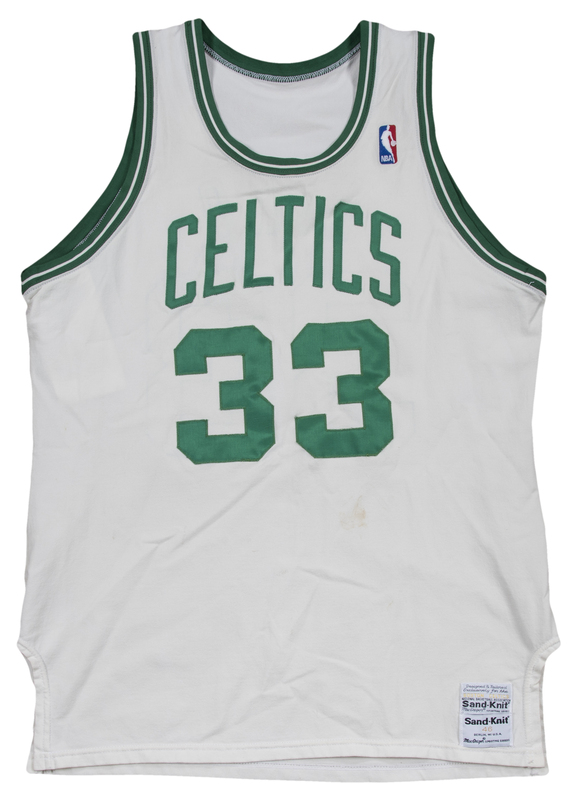 Larry Bird, the Boston Celtics cold-hearted sharpshooter, wore this jersey during the 1986-87 NBA season, his eighth in the Association. The Class of 1998 Hall of Famer was coming off of a streak of winning three consecutive NBA MVP awards, a nearly unprecedented achievement, and continued to perform at his silky peak, denied a fourth MVP nod only by the transcendent point guard play of his archrival Magic Johnson. The Indiana native was unstoppable in 1986-87, averaging 28.1 points, 9.2 rebounds, and 7.6 assists per game and recording the first 50/40/90 season in NBA history by shooting over 50% from the field, 40% from the three-point line, and 90% from the charity stripe. 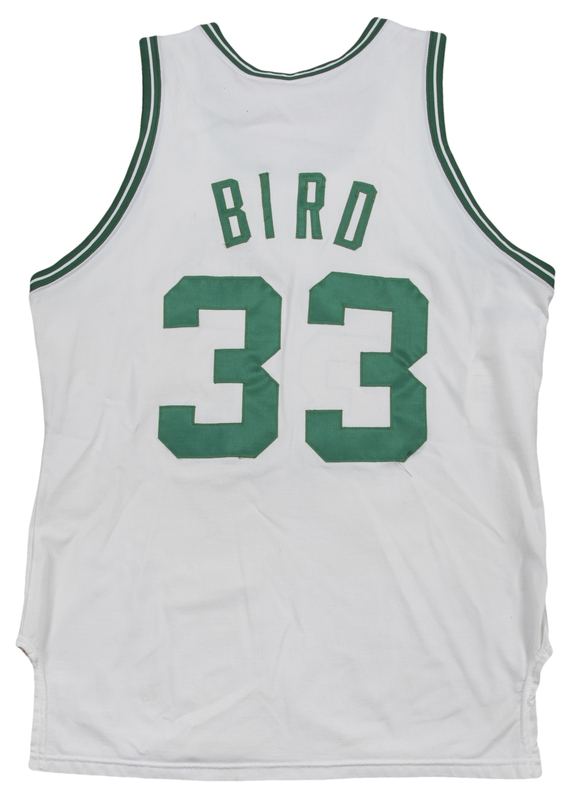 Bird, an All-Star in 1986-87, led the Celtics to the NBA Finals for the fourth consecutive season, defeating the Bulls, Bucks, and Pistons to set up a matchup with Magic and the “Showtime” Lakers on the NBA’s grandest stage. The Celtics, ravaged by injuries to Bill Walton, Danny Ainge, and Robert Parish, put up a valiant fight, but fell in six games to one of the best teams in NBA history. This offered home jersey is one of the finest Larry Bird game jerseys ever offered. 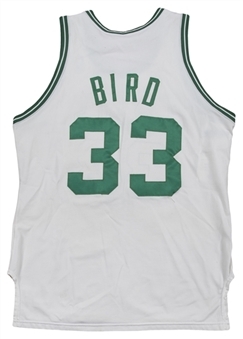 This jersey is white and has “CELTICS” and Bird’s number “33” sewn on the front of the jersey in green tackle twill. 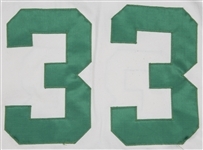 “BIRD” and a second “33” are sewn on the back of the jersey in green tackle twill. 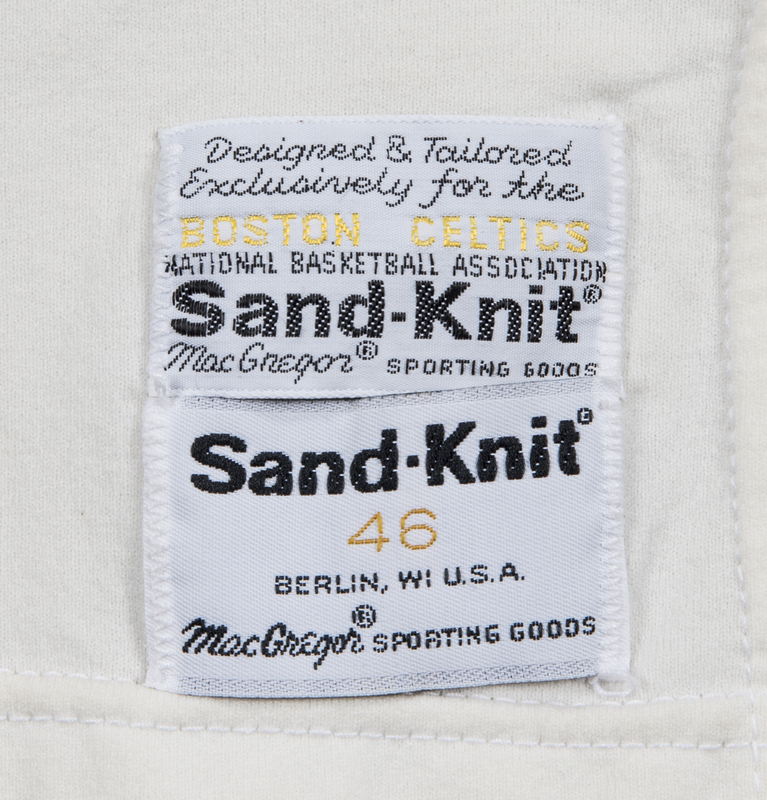 A NBA logo patch is sewn on the left shoulder, and Sand-Knit size “46” and Celtics tags are sewn on the front left tail of the jersey. 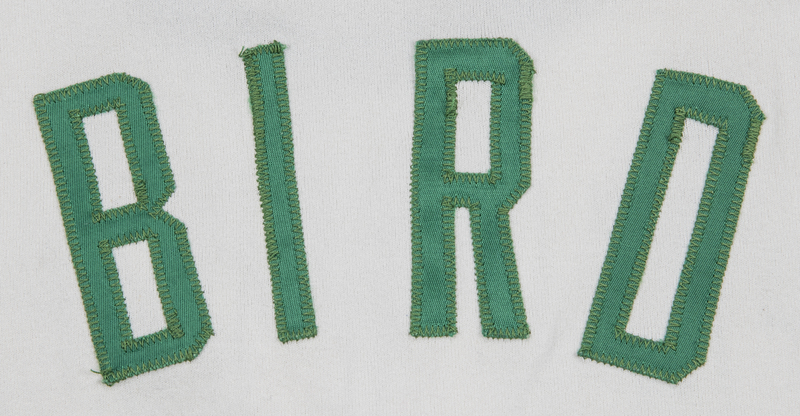 The sleeves and collar are accented with a green/white/green pattern. 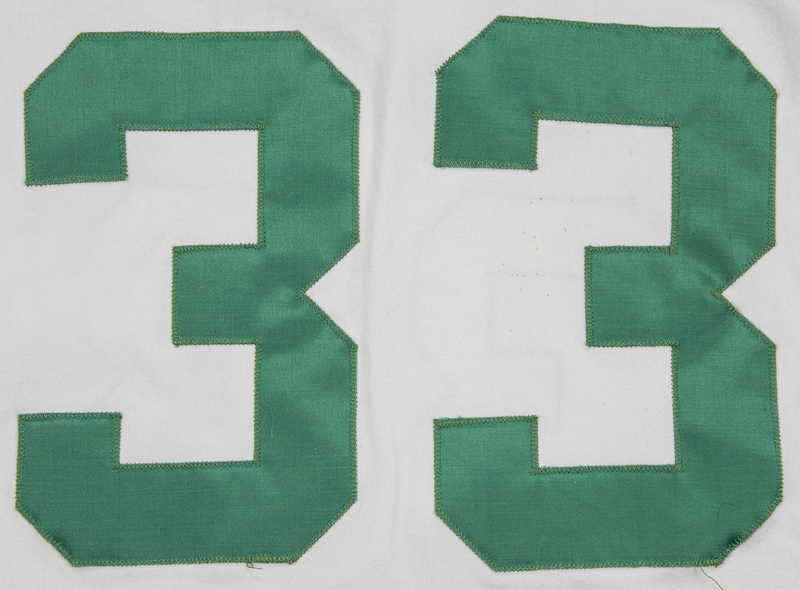 This jersey shows moderate use with a light stain below the right “3” on the front of the jersey, displays minor toning and is in excellent overall condition. A truly wonderful gamer from Larry Legend’s prime. 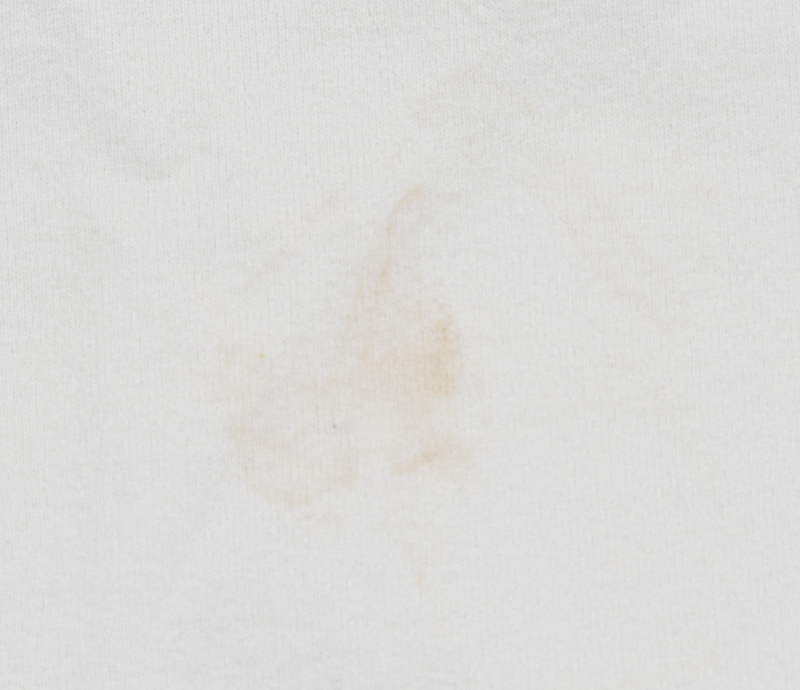 This jersey is accompanied by a LOA from MEARS (314311), who have assigned this jersey a perfect A10 grade.